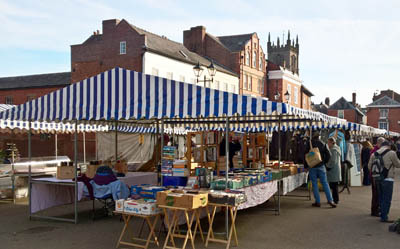 Ludlow has held street markets since the twelfth century. 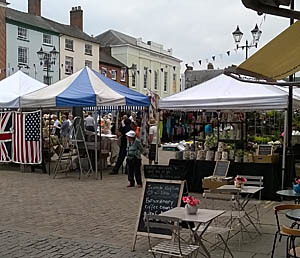 Nowadays, a traditional open-air market, managed by Ludlow Town Council, takes place in the town square (Castle Street) every Monday, Wednesday, Friday and Saturday throughout the year. More than forty stalls selling a range of goods including fresh produce, cheeses, books and a selection of local crafts. In addition to the regular market, most Sundays see the market stalls being used either as a flea market (usually fortnightly), or for various specialist themes, such as books, gardens or crafts. A Local Producers Market (or farmers' market), organised by Local to Ludlow, is held on the second Thursday and fourth Thursday of each month. This has 20 or 30 stalls with producers selling food and drink from within a 30-mile radius of Ludlow. Made in Shropshire Market is a monthly showcase for local artists, design-makers and artisan food producers from Shropshire. The market is usually held on the first Saturday of the month. A variety of seasonal markets are held at appropriate times of the year including Ludlow Christmas Markets. For dates of the various specialist markets please see our Events pages. For further information please contact the Markets Manager on 01584 871972.